I've had a number of requests for a homemade summer sausage recipe since I started writing this sausage making section of my website. I have to confess to being a little confused in the first place because I'd never heard of Summer sausage so I guess the first place to start is to state exactly what it is that my recipe below is actually making! What Is A Summer Sausage? Summer sausage is a cured sausage which therefore can be preserved. It's an American term for a sausage that is typicaly made in the Autumn (Fall) or Winter and was then stored over the Winter to be then eaten in the Summer. It's a fermented sausage (like salami, pepperoni or chorizo) which technically means that it's not cooked. That said, I'm not going risk making a raw sausage at home so my version will be cooked so that we don't put ourselves in hospital. The casing for your homemade Summer sausage is a plastic fibrous casing and is therefore inedible. I haven't used this style of casing in any of my other recipes so you may need to make a special purchase. 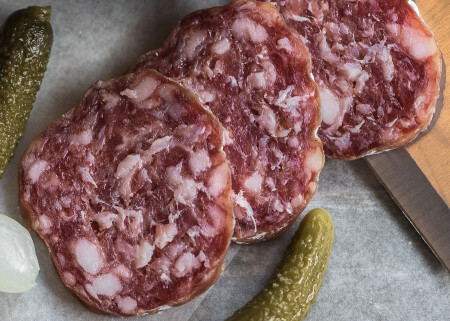 The other special ingredient which gives Summer sausage it's distinctive flavour is Fermento. When Summer sausage is made naturally the fermentaion process produces lactic acid which gives the sausage that tart flavour. Adding Fermento to the list of ingredients basically gives us the tart flavour without doing the fermentation step. You can easily buy Fermento from Amazon. You will need 2 fibrous plastic casings 65mm (2½") diameter and 450mm (18") long. These casings need to be soaked in warm water for 30 minutes prior to stuffing. Grind up the diced meat and fat with a 5mm plate or smaller and then return the meat to the refrigerator for about 30 minutes. Mix all the powdered ingredients together in a large mixing bowl and then add the syrup and the water. Mix thoroughly and then refrigerate for 15 minutes. Now add the chilled ground meat to the seasoning mixture and knead well for about 5 minutes until everything is well mixed. Return this mix to the refrigerator for further chilling whilst you get your stuffer and casings set up. Stuff the sausage mix into the casings and tie the end. Refrigerate overnight to allow the seasonings to evenly distribute througout the sausage. Set your smoker up on a very low heat (60°C / 140°F), place the sausage sticks in the smoker and dry them for about 30 minutes. You now need to smoke the sausage for a couple of hours at the lowest temperature possible so the best way to do this is to use a cold smoke generator. After the cold smoking step gradually raise the temperature of your smoker to 80°C (175°F) and continue cooking (with or without smoke) until the core temperature reaches 60°C (140°F). Finish off the cooking by steaming or poaching your homemade Summer sausage. Allow it to cool and you're ready to slice and serve.